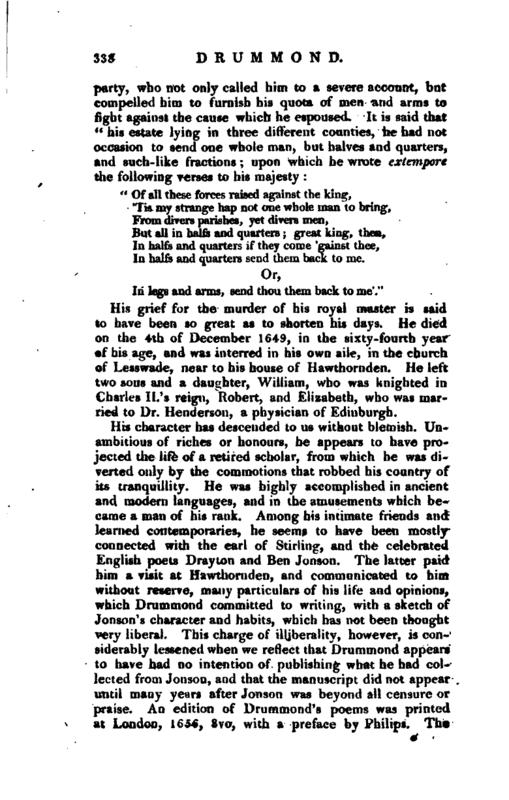 , an elegant and ingenious poet, a descendant of the ancient family of the Drummonds of Carnock, and the son of sir John Drummond of llawthornden, was born, probably at Hawthornden, his father’s seat in Scotland, on the 13th of December, 1585. He received his school education at Edinburgh, and afterwards studied at the university of that city, where he took the degree of master of arts. At the age of twenty-one he went to France, in compliance with his father’s views, and attended lectures on the civil law, a subject on which he left sufficient documents to prove that his judgment and proficiency were uncommon. 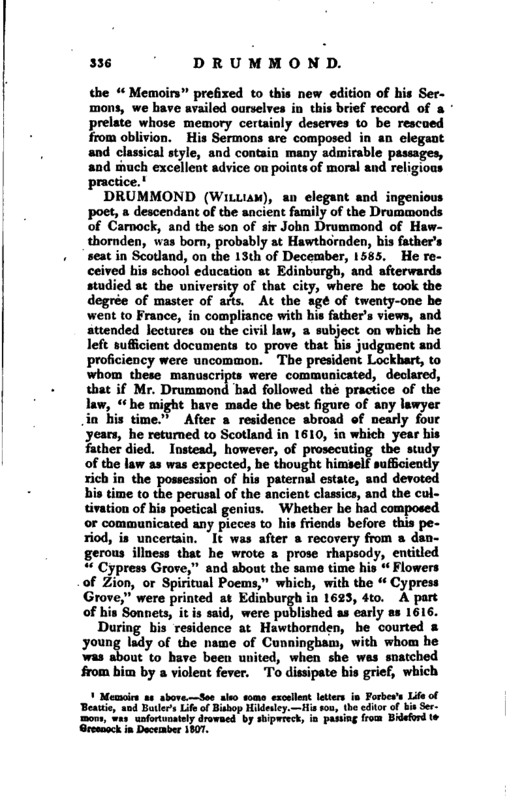 The president Lockhart, to whom these manuscripts were communicated, declared, that if Mr. Drummond had followed the practice of the law, “he might have made the best figure of any lawyer in his time.” After a residence abroad of nearly four years, he returned to Scotland in 1610, in which year his father died. Instead, however, of prosecuting the study of the law as was expected, he thought himself sufficiently rich in the possession of his paternal estate, and devoted his time to the perusal of the ancient classics, and the cultivation of his poetical genius. Whether he had composed or communicated any pieces to his friends before this period, is uncertain. 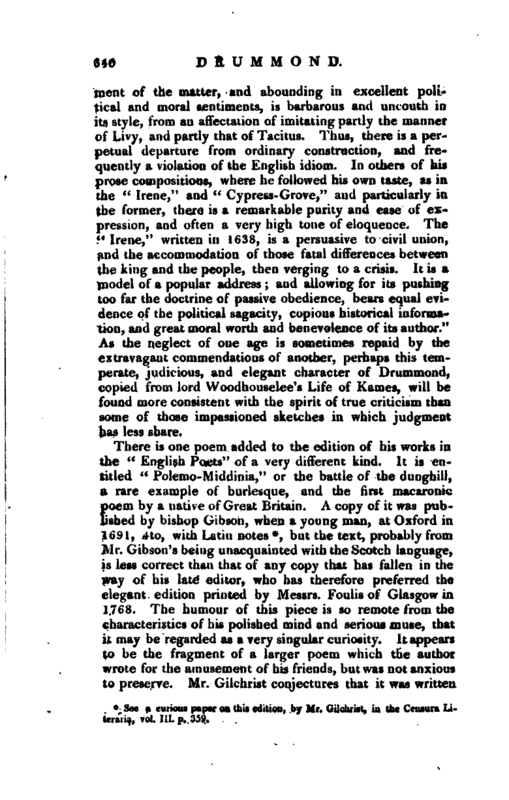 It was after a recovery from a dangerous illness that he wrote a prose rhapsody, entitled “Cypress Grove,” and about the same time his “Flowers of Zion, or Spiritual Poems,” which, with the “Cypress Grove,” were printed at Edinburgh in 1623, 4to. A part of his Sonnets, it is said, were published as early as 1616. During his residence at Hawthornden, he courted a young lady of the name of Cunningham, with whom he was about to have been united, when she was snatched from him by a violent fever. To dissipate his grief, which | every object and every thought in this retirement contributed to revive, he travelled on the continent for about eight years, visiting Germany, France, and Italy, which at that time comprized all that was interesting in polished society and study to a man of curiosity and taste. During this tour he enriched his memory and imagination, by studying the various models of original poetry, and collected a valuable set of Greek and Latin authors, with some of which he enriched the college library of Edinburgh, and others were reposited at Hawthornden. The books and manuscripts which he gave to Edinburgh were arranged in a catalogue printed in 1627, and introduced by a Latin preface from his pen, on the advantage and honour of libraries, which at that time were considered rather as accidental collections than necessary institutions. In halfs and quarters send them back to me. In legs and arms, send thou them back to me." His grief for the murder of his royal master is said to have been so great as to shorten his days. He died on the 4th of December 1649, in the sixty-fourth year of his age, and was interred in his own aile, in the church of Lesswade, near to his house of Hawthornden. He left two sons and a daughter, William, who was knighted in Charles II.’s reign, Robert, and Elizabeth, who was married to Dr. Henderson, a physician of Edinburgh. Mr. G. Chalmers is of opinion that the learned Ruddiinan assisted in preparing this edition. 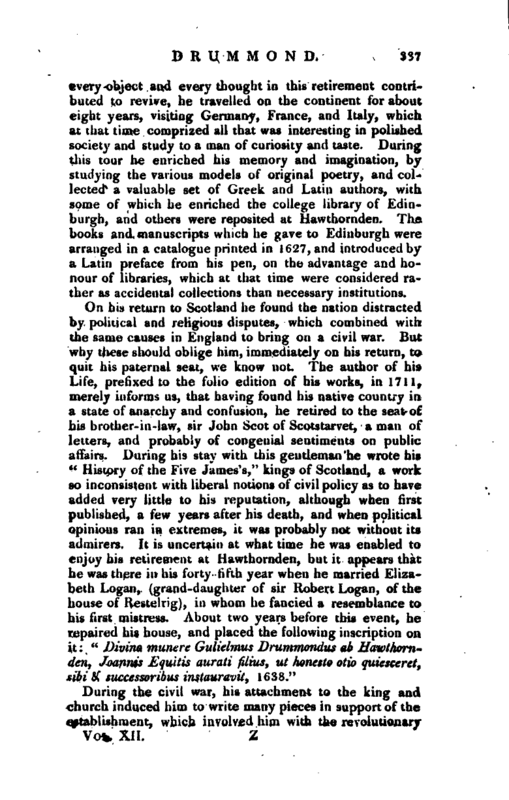 Chalmers’s Life of Ruddijnan, p. 53. A recent edition of his poems was printed at London in 1791, but somewhat differently arranged from that of 1656. A more correct arrangement is still wanting, if his numerous admirers shall succeed in procuring that attention of which he has been hitherto deprived. 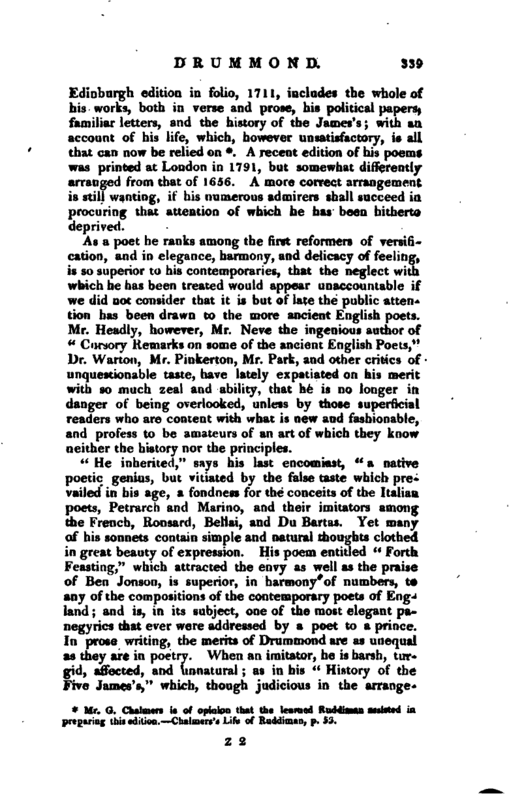 As a poet he ranks among the first reformers of versification, and in elegance, harmony, and delicacy of feeling, is so superior to his contemporaries, that the neglect with which he has been treated would appear unaccountable if we did not consider that it is but of late the public attention has been drawn to the more ancient English poets. Mr. Headly, however, Mr. Neve the ingenious author of “Cursory Remarks on some of the ancient English Poets,” Dr. Warton, Mr. Pinkerton, Mr. Park, and other critics of unquestionable taste, have lately expatiated on his merit with so much zeal and ability, that he is no longer in danger of being overlooked, unless by those superficial readers who are content with what is new and fashionable, and profess to be amateurs of an art of which they know neither the history nor the principles. “He inherited,” says his last encomiast, “a native poetic genius, but vitiated by the false taste which prevailed in his age, a fondness for the conceits of the Italian poets, Petrarch and Marino, and their imitators among the French, Ronsard, Bellai, and Du Bartas. Yet many of his sonnets contain simple and natural thoughts clothed in great beauty of expression. His poem entitled” Forth Feasting,“which attracted the envy as well as the praise of Ben Jonson, is superior, in harmony of numbers, to any of the compositions of the contemporary poets of England; and is, in its subject, one of the most elegant panegyrics that ever were addressed by a poet to a prince. In prose writing, the merits of Drummond are as unequal as they are in poetry. When an imitator, he is harsh, turgid, affected, and unnatural; as in his” History of the Five James’s,“which, though judicious in the | arrangement of the matter, and abounding in excellent political and moral sentiments, is barbarous and uncouth in its style, from an affectation of imitating partly the manner of Livy, and partly that of Tacitus. Thus, there is a perpetual departure from ordinary construction, and- frequently a violation of the English idiom. In others of his prose compositions, where he followed his own taste, as in the” Irene,“and” Cypress-Grove,“and particularly in the former, there is a remarkable purity and ease of expression, and often a very high tone of eloquence. The” Irene,“written in 1638, is a persuasive to civil union, and the accommodation of those fatal differences between the king and the people, then verging to a crisis. 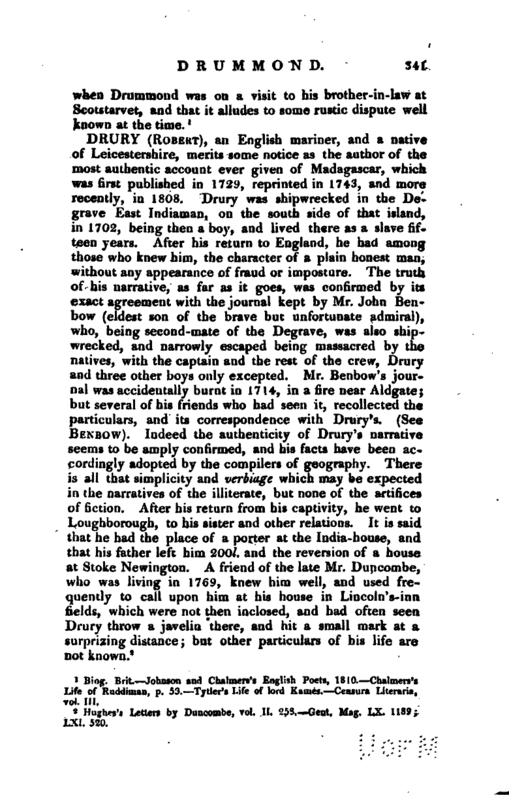 It is a model of a popular address; and allowing for its pushing too far the doctrine of passive obedience, bears equal evidence of the political sagacity, copious historical information, and great moral worth and benevolence of its author.” As the neglect of one age is sometimes repaid by the extravagant commendations of another, perhaps this temperate, judicious, and elegant character of Drummond, copied from lord Woodhouselee’s Life of Kames, will be found more consistent with the spirit of true criticism than some of those impassioned sketches in which judgment has less share. See a curious paper on this edition, by Mr. Gilchrist, in the Censura Literaria, vol. III. p. 359. Biog. Brit. Johnson and Chalmers’s English Poets, 1810. Chalmers’s Life of KudUiman, p. 53. Tytler’s Life of lord Kames. Centura Lileraria, vol. III.